The third Euro-Fighter in the United States, Dare Devil Dive, is now open at Six Flags Over Georgia. 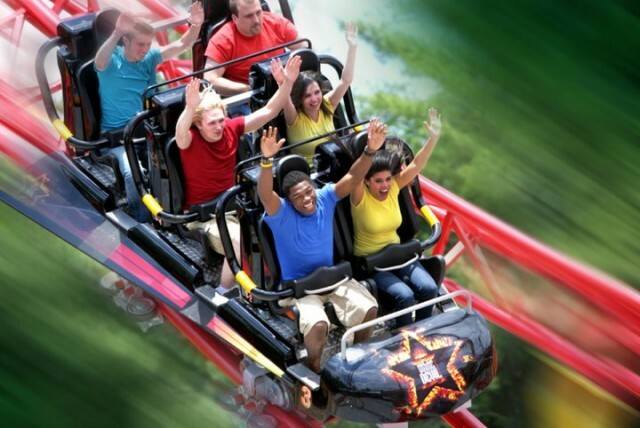 New for 2011, Dare Devil Dive at Six Flags Over Georgia is just the third Euro-Fighter to open in the United States. Beginning with a 90-degree incline, the cars crest the lift before dropping down a beyond vertical drop accelerating to 52 mph. What follows is easily one of the most twisted rides I have ever seen. The first half of the ride feels like it was designed by a new-comer to No Limits (which is by no means bad). The airtime is supposedly great and is an excellent “supporting-role” coaster to the park. What I find to be the most interesting aspect about the ride is the new style. The coaster completely differentiates from previous EuroFighters with a 3-spine track on almost the entire ride. In addition, the new cars are arranged in 3 rows of 2 for a total of 6 passengers vs the 2 rows of eight in the 8-passenger old trains. However, despite the lowered capacity, the new restraints feature lap bars that allow for a greater sense of freedom never before experienced on this type of coaster. At some point, is this even still a EuroFighter? Despite the terminology used to describe the coaster, I expect Dare Devil Diver to be the sleeper hit of 2011 similar to Sky Rocket in 2011. While it may not get too much attention, it is a welcome addition to the already popular park. Could we see more of these coasters added to other Six Flags parks in the near future? I sure hope so. Leave a comment with your Park Thoughts below. Starting this Friday, June 3, 2011, guests at the Disneyland Resort will be able to experience Soundsational Summer marking the opening summer of 4 different attractions across both parks. In Disney California Adventure, Little Mermaid and Goofy’s Sky School will open to guests for the first time, and across the esplanade in Disneyland, Star Tours and Mickey’s Soundsational Parade are both new for 2011. In Disney California Adventure, as part of the $1 billion expansion, the park is reopening the old Mullholland Madness with an entirely new theme and story to match the 1920’s time period. Inspired by the old How to… cartoons, Goofy has converted his chicken farm into a flying academy with riders as the students. While the ride remains the same aside from a new paintjob and a few props, it’s a welcome addition. Learn to Fly, the Goofy Way! Adjacent to Sky School, Paradise Gardens will also open up. The new dining facility will include two restaurants along with an elaborate new seating area with plenty of shade (something the original California Adventure was greatly lacking). While Disney has said that both of these new additions will open July 1, I suspect that Sky School could open as early as this Friday. Just down the path from Goofy’s Sky School and Paradise Gardens is the highly anticipated Little Mermaid’s Ariel’s Undersea Adventure. 22 years after the movie opened in theaters, this is the first dark ride ever to be based on the classic tale. Reviews have been a mixed bag, with some saying it is a great addition others deeming it as a weak and disappointing. I have not watched any videos myself trying to save it all for the magical moment where I ride it myself, but check out this POV during a soft opening from last week. Video courtesy of juliereigoldstein. And arguably the most exciting new addition for Soundsational Summer 2011 is the reopening of Star Tours. Guests will be able to travel to over 6 different planets with 54 different combinations. This new system allows guests to ride it over and over again without experiencing the same journey twice. Again, I have not cheated and watched a POV yet, but above is a preview video from Asianjma123. Soundsational Summer begins June 3, however Little Mermaid and Star Tours have been running previews daily since last week. Mickey’s Soundsational Parade is also running twice daily now thru the rest of the summer. Go check it out and send us your reviews! What are you most excited for in Soundsational Summer? Leave a comment with your Park Thoughts below. 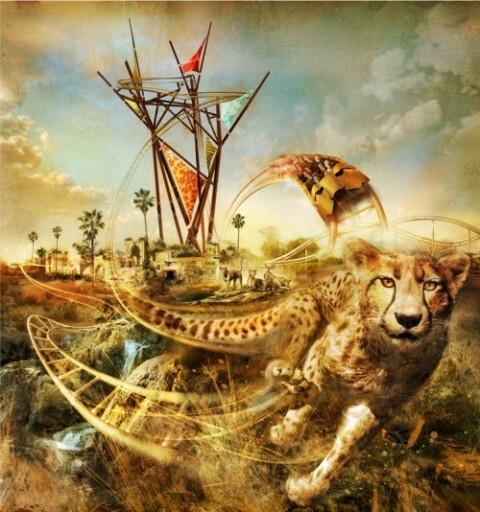 We’re just 2 days away from the grand opening of Cheetah Hunt at Busch Gardens Tampa. The highly anticipated summer 2011 addition features one of the largest layouts of any single coaster on the planet traversing a massive section of the park. To excite guests, today the park released a point of view video (sans audio) that shows the entirety of the ride. Take a look for your first glance at what is sure to be, one of the biggest hits of the summer. From early ride reviews and after seeing this video, there seems to be no doubt that Cheetah Hunt holds its own against Busch Gardens Tampa’s other 3 major giants, Montu, SheiKra, and Kumba. The sensation of speed seems to be best achieved through the first launch when the trains are surrounded by the decorative walls. The figure-eight element appears to go just slow enough to give some great views but still maintain speed. And just like I predicted, the greatest asset of the ride appears to be it’s terrain hugging, park traversing layout. What do you think of Cheetah Hunt? How does it compare to the New Texas Giant? Leave a comment with your Park Thoughtsbelow.